Product prices and availability are accurate as of 2019-04-12 14:58:54 EDT and are subject to change. Any price and availability information displayed on http://www.amazon.com/ at the time of purchase will apply to the purchase of this product. Sometimes there isn't an Ethernet jack around when you need one. 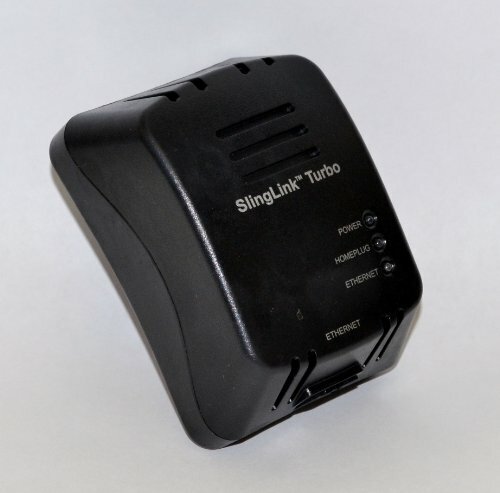 The SlingLink Turbo W1 is a HomePlug ethernet adapter that enables network connectivity using any available electrical outlet, allowing connection to various devices including a DISH Network receiver, SlingBox, video game console, computer, and anything with an Ethernet jack. The DISH Network ViP series of receivers have built-in SlingLink technology so they would require only one SlingLink plugged into an electrical outlet near the router to connect the compatible DISH receiver to the internet. For other devices, two SlingLink adapters are required (one for the router and one for the device) to receive network access. Package includes 1- Ethernet Adapter, 1- 10FT Ethernet Cable and User's Manual Easy to install and setup. Enables network access where power outlet is available This item is sold individually. However, most applications will require 2. They communicate over the electrical wiring in your home. SlingLinks installed in homes with older wiring may have slower speeds. Each SlingLink must be plugged into circuits that connect in the same breaker box (most homes only have 1 breaker box, so this is usually not a problem). Make sure each SlingLink is plugged directly into a wall outlet. Do not plug into a surge protector as it may filter out the signal.